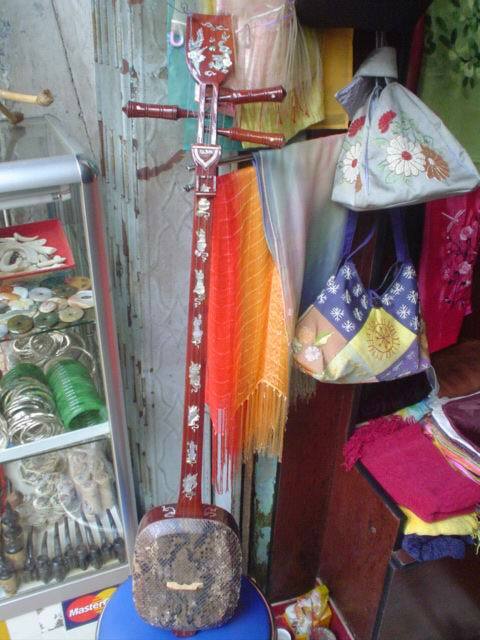 This three-stringed lute is used by several ethnic groups in Vietnam. The Viet call it Dan Tam, whereas the Ha Nhi call it Ta in. This instrument exists in three sizes: large, medium, and small. The small is the most popular. The sound box is oval-shaped, and the soundboard is pierced with sound holes. A bridge is fixed on the soundboard. The neck made of hard wood is fairly long and bears no frets, only three wooden pegs for tuning. The three strings are traditionally made of twisted silk, but are now more commonly made of plastic. The player uses a plastic plectrum, which he uses for plucking downward or upward in quick intervals. The tones of the Dan Tam are bright and cheerful and they carry far. The techniques for the left hand include tremolos, trills, picking, stopping and especially sliding, which are played in combination with the quick plucking of the right hand. Full tones, three-quarter tones and quarter-tones can be played. The Dan Tam is often part of an eight instrument band or an orchestra accompanying cheo drama. At present, a fourth string may be added. The Japanese samisen, the Chinese sangen, the Chinese sanxian, the Mongolian dandze, and the Persian setar fall into the same category as the dan tam.